Pet food companies are taking advantage of premiumization and palliative care in formulation, freeze drying and twin-screw extrusion in processing. "Love them like family, feed them like family." That's the motto of pet food maker Blue Buffalo Co., but it nicely captures the current sentiment of pet owners … and all makers of pet food. Pet food is a $26 billion a year business, growing at 6 percent and showing no signs of slowing, according to market research firm Packaged Facts. And higher-end products like those at Blue Buffalo – typically $60 and up for a 30-lb. bag -- are enjoying even higher growth rates. Speaking of Blue Buffalo, it was the last independent of the five top-selling pet food companies … until now. At the end of February, General Mills announced a deal to acquire the premium pet food company for $8 billion. There are numerous parallels between the pet food market and the rest of the food industry. Millennials and ecommerce are changing the business. Premium and niche products are growing faster. Gluten-free products and clean labels are of growing importance. Food safety is paramount. And the leading suppliers are Mars, Nestle and J.M. Smucker, although you won't find their names on bags of Iams, Purina or Gravy Train, respectively. The U.S. has 517 pet food manufacturing facilities. "It's an exciting time to be in the business," says Cathleen Enright, outgoing CEO of the Pet Food Institute (www.petfoodinstitute.org). "Just as with human food shoppers, today’s pet food shoppers live in the era of instant information. There is a growing interest in understanding issues related to the manufacturing of food and the ingredients used. This overarching theme plays a role in shaping the various trends within pet food." Much of the growth in pet food has to do with the rapid acceleration of online sales, particularly with behemoths Amazon.com and Chewy.com, notes David Sprinkle, research director for Packaged Facts (www.packagedfacts.com). "Internet sales of pet products are outpacing and even stealing sales from other channels, notably pet super stores," he says. PetSmart found a way to fight back: It bought Chewy.com in mid-2017 and closed down PetSmart's own efforts at ecommerce. Chewy.com was only founded in 2011 but it was reported to have sales of $880 million in 2016 and was projecting $1.5 billion for 2017. More pet parents looking for foods with preventative health benefits. So pet nutrition research is focusing a great deal on protein, vegetables, pet aging and obesity. Clean-label ingredients play as great a role in pet nutrition these days as it does in human nutrition. In fact, retail intelligence from Spins (www.spins.com) points to a spike in availability of clean-label and better-for-you pet treats, and expects to see more functional ingredients in pet products this year. Spins pegs pet treats with probiotics at $1.4 million and growing at a rate of 31.6 percent a year. One dog treat featuring probiotics is functional frozen yogurt from the Bear & The Rat, which offers bacon & peanut butter, banana & peanut butter and pumpkin flavors. Formulators are developing more products to help animals cope with the physical changes, such as joint problems, arthritis and other signs of growing older by incorporating functional ingredients and adjusting nutrient levels. Hill's Science Diet Adult Healthy Mobility uses glucosamine and chondroitin and omega-3 fatty acids "to improve mobility in 30 days." Purina One SmartBlend Vibrant Maturity 7+ Senior Formula uses medium chain triglycerides (MCTs) as a "brain-friendly fuel that feeds the neurons and keeps the brain cells active." Nestle's Purina Petcare is said to have more than 500 scientists on staff, including food scientists, nutritionists and veterinarians. Research from Mars Petcare’s Waltham Centre for Pet Nutrition (www.waltham.com) shows similarities between dogs and humans as they both age: graying hair, wrinkled skin and more aches and pains and a rise in inflammation and immune system changes. The researchers tracked the biochemical health of dogs over a 10-year period. As the dogs aged, protective proteins within their bodies diminished. "Combined with regular veterinary check-ups, improved diets for seniors could potentially deliver more healthy active years for older dogs. However, more long-term research will be needed before optimum nutrition for every life stage [of pets] can be fully understood," the study mentions. Trends in human food such as transparency, health and wellness and personalization are already crossing into pet food, Mintel says. Pet owners want food formulas that uniquely suit their companion animals and ensure health and wellness. Both Eukanuba and Royal Canin have portfolios of breed-specific formulas, from Yorkshire terriers to rottweilers. Instinct Petfood-The Raw Brand (www.instinctpetfood.com) for cats and dogs, a part of Nature's Variety, produces raw frozen foods incorporating animal protein (meat, for essential amino acids) whole fruit and vegetables, coconut oil, apple cider vinegar and turmeric to maintain pets' overall wellness, immune and digestive health and lean muscles. The recipes exclude grain, corn, wheat, soy and potato and other ingredients the company says can cause food sensitivities. "We set out to really change the way people think about pet food and create a movement toward better pet health," explains CEO Reed Howlett. "If we could get the nutrition of raw into more bowls, we'd transform the lives of more pets." Ancient grains like quinoa are even going to the dogs. The Honest Kitchen (www.thehonestkitchen.com) developed a Chicken & Quinoa food as well as Beef & Chickpea, Duck & Sweet Potato, and Fish & Coconut blends. Blue Buffalo Co. Ltd. (bluebuffalo.com), created a Chicken & Quinoa Ancient Grains recipe, while a grain-free line from Nestle Purina Petcare's Beneful is now "accented with blueberries, pumpkin and spinach." Pet obesity concerns pet owners, and calorie intake can vary greatly depending on the size of the pet. Blue Dog Bakery (www.bluedogbakery.com) has been making better-for-them, low-fat dog treats since 1998, using "human-grade" ingredients with no animal by-products, artificial flavors, colors or preservatives. From grain-free biscuits and pea-protein paw-shaped bites to soft, chewy trainers and meat snacks, each treat has as few as 3 calories. Brand manager Lara Gusa says one of the top trends this year is using plant-based ingredients. "Pea and chickpea flour can substitute for wheat or other grains," she says. "These simple ingredient swaps can help with pets’ dietary sensitivities, while maintaining high-quality nutritional content. Trends this year align closely with trends in human foods. That means a push for cleaner-label treats free from artificial flavors, colors and preservatives, as well as label transparency, so pet parents can easily understand ingredients inside products. As we eat more natural and wholesome ingredients ourselves, so do our pets." Often pickier than dogs, cats are true carnivores that require high protein and certain amino acids found only in meat, says Cornell University College of Veterinary Medicine. For cats favoring gravies, Fruitables Chicken Broth Bowls cat food toppers (www.fruitablespetfood.com) from Vetscience LLC are broths in handy pourable paperboard cartons. Low in calories and sodium, they add flavor and hydration and accommodate cats of all ages. To cater to pet owners’ desire to provide top-quality nutrition, pet food processors employ some of the most advanced technologies in food processing. Consider high-pressure processing (HPP). Many of the hottest new refrigerated products in recent years take advantage of this nonthermal process to pasteurize meat, juice and other products without destroying nutrients. For Stella & Chewy’s Pet Food Co., HPP is old hat. The Oak Creek, Wis., company launched in 2007 with raw, frozen beef patties. Prior to packaging, bulk ingredients were trucked to American Pasteurization Co. in nearby Milwaukee for HPP treatment, making Stella & Chewy’s one of the earliest clients of North America’s first HPP tolling service. A few years later, Nature’s Variety in Lincoln, Neb., began applying in-container HPP to its minimally processed pet products after suffering a Salmonella recall. Driven by refrigerated and raw products, HPP of pet food is a growing application, according to Erroll Raghubeer, senior vice president-R&D of Avure Technologies (www.avure-hpp-foods.com), an Erlanger, Ky., maker of HPP machines. Most treatment is done at tolling facilities, although “we expect more manufacturers to bring it in house very soon,” he says. Pet food manufacturers usually apply the pasteurization step to raw materials and either sell it refrigerated or frozen or form it in a clean room and then freeze dry or heat dry the final product. Freeze drying is used at Stella & Chewy’s. Raw coated kibble and raw meal mixers are freeze dried. Other pet food manufacturers have followed suit, including Champion Pet Foods, a Canadian firm that opened a 371,000-sq.-ft. plant in Auburn, Ky., in 2016. High energy costs have relegated freeze drying to niche status in human foods, but premium dog food commands the kinds of margins that make freeze drying feasible. Nonetheless, lower processing costs are desirable in any market segment, and that makes pet food manufacturers receptive to alternatives. An example is the dehydration technology from EnWave Corp. (www.enwave.net), a Vancouver, British Columbia, firm. EnWave’s dryers use microwave heating under vacuum to lower the boiling point of water to about 50°C from 100°. Product tumbles inside a chamber during the semi-continuous process to ensure all surface areas are exposed to the microwaves. The process shortens drying time and avoids the multiple phase changes that occur with freeze drying and contribute to its high energy costs. As water within the product evaporates, air fills the void, causing material to puff. The result is a product that is crunchy rather than spongy. Dubbed radiant energy vacuum by the manufacturer, the technology has been licensed to produce shelf-stable cheese snacks and yogurt. Perdue Farms became the exclusive licensee for pet food in 2016. It is used by Perdue’s Full Moon Pet Treats division. In pet food processing, twin-screw extruders mix up to 40 percent fresh meat with cereal or other ingredients to produce shelf-stable dry kibble. By controlling water activity and pH, processors are able to create a finished product that does not support microbial growth or go rancid. FDA always has had jurisdiction over pet food manufacturers, though the Food Safety Modernization Act raised the bar. 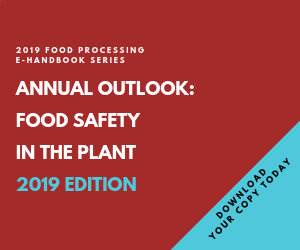 They must now comply with current Good Manufacturing Practices, conduct hazard analyses that support preventive actions and otherwise comply with the same standards as mainstream food processors. A cultural change is underway in pet food plants, but if history is any guide, those processors will take advantage of some of the most effective tools available. Last of the big pet food brands acquired; helps reshape General Mills' portfolio. $5.8 billion for former Del Monte pet brands, including Gravy Train and Meow Mix.